Users first weigh their vehicles at the scalehouse prior to dumping their garbage on a tipping floor. The vehicle then gets weighed-out at the scalehouse to determine the weight of the waste dumped. The cost is calculated and deducted from an established account or payment by check is required at that time. Click on "Setting Up A Transfer Station Account" for more information regarding payments. Cash and credit cards are not accepted. For 2019, the cost to tip solid waste increased by 1.5% or by $1.45/ton. 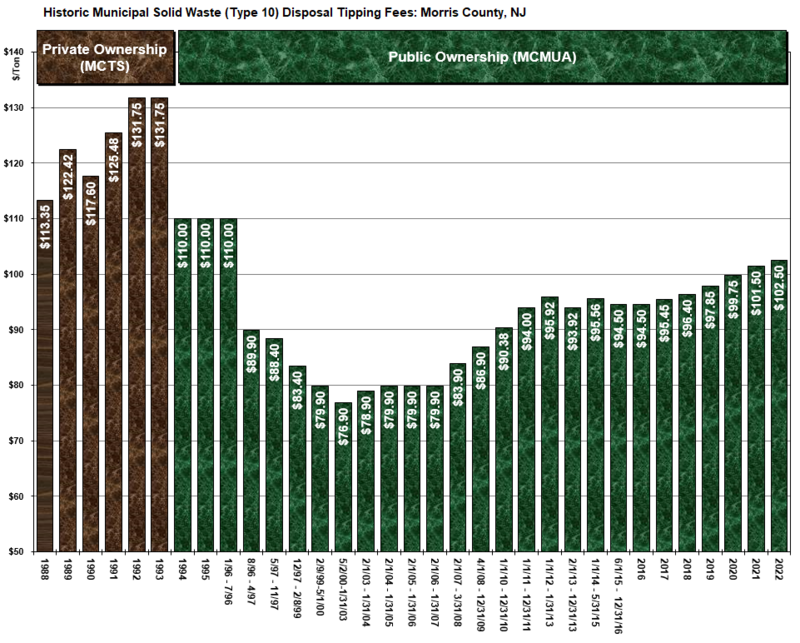 All disposal fees listed include the $3.00/ton New Jersey recycling tax that took affect on April 1, 2008. Click here for more information on this N.J. Recycling Tax. All disposal fees include a host community benefit of approximately $5.11/ton. The host community benefit is comprised of a $4.50/ton benefit paid directly to the host communities plus a 10% discount on the waste the two host municipalities tip at the transfer station. This 10% discount spread amongst all the tons tipped at the transfer stations ranges from approximately $0.60/ton to $0.65/ton and fluctuates based on the relative amount of waste tipped by the host communities versus the tonnages from all the other transfer station customers. December 11, 2018 - Notice of $1.45/ton tipping fee increase to $97.85/ton for all waste types beginning January 1, 2019. The holiday schedule for 2019 is provided. December 1, 2017 - Notice of $0.95/ton tipping fee increase to $96.40/ton for all waste types beginning January 1, 2018. The holiday schedule for 2018 is provided. December 1, 2016 - Notice of $0.95/ton tipping fee increase to $95.45/ton for all waste types beginning January 1, 2016. May 27, 2015 - Notice of $1.06/ton tipping fee decrease to $94.50/ton for all disposal waste types beginning June 1, 2015 and continuing through the end of 2016. December 5, 2013 - Notice of $1.64/ton tipping fee increase to $95.56/ton for all waste types. December 20, 2012 - Notice of $2.00/ton tipping fee decrease to $93.92/ton for all waste types. December 8, 2011 - Notice of tipping fee increase to $95.92/ton for most waste types; transfer station holiday schedule for 2012. December 8, 2010 - Notice of 2011 tipping fee increase to $94/ton for most waste types. October 9, 2009 - Notice of four percent tipping fee increase to $90.38/ton for most waste types announced for 2010. Notice of 3.00/ton tipping fee increase to $86.90/ton for most waste types. This increase was due to the state's imposition of $3/ton recycling tax that took affect on April 1, 2008.